"This is a straightforward, rich resource for anyone who lives with, and loves, an addict." —Publishers Weekly Everyone suffers when there’s an addict in the family. Written by an expert in alcohol and drug addiction and recovery, this no-nonsense guide will help you understand the causes of addiction, end enabling behaviors, support your loved one’s recovery, and learn how to cope with relapses. If you’re the family member of an addict, you may feel confused, guilty, and scared of doing the wrong thing. And when you don’t know how to help, you may find yourself in a codependent role, trying so hard to keep your addicted loved one alive, out of jail, or emotionally appeased that you may actually prevent them from realizing they need help. Drawing on her own personal experience with her brother’s addiction, Addict in the House by Robin Barnett and Darren Kavinoky offers a pragmatic, step-by-step guide to dealing with a loved one’s addiction, from accepting the reality of the disease to surviving what may be repeated cycles of recovery and relapse. You’ll learn how to encourage your addicted loved one to get help without forcing it, and finally find the strength to let go of codependence. 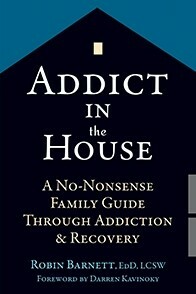 With this revealing and straightforward book, you’ll have the support you need to take an honest look at how addiction has affected the family, cope with the emotional hurdles of having an addicted family member, create and maintain firm boundaries, and make informed decisions about how to best help your loved one.